I think we did great other than we made one mistake: The mistake was not being more careful with Chris Broussard, and there is a collective responsibility there. Chris Broussard's job was to come on and talk about the news of the league, how the league was representing it, and through a series of events he made personal comments which was a mistake. Well, ESPN didn't do great, and "the series of events" that led to Broussard's sermon didn't come down to an anchor leading him in the wrong direction, either. It's a rotten institutional problem. ESPN encourages faux-antagonism; debate is an end unto itself in Bristol, and the result is the sort of warped view of reality that considers the opinion of a gay man preaching tolerance as somehow equivalent in moral and intellectual heft to the thoughts of a bigot pushing doctrine from the shittiest parts of Leviticus. Broussard acknowledged as much. "On ESPN, a lot of times it's giving your opinion," he said. "And that's what I did." Deitsch asked Skipper if he'd talked to Broussard and OTL producers. He had. I had a discussion with everybody. They said, 'Look, we brought [ESPN.com columnist] LZ Granderson on to talk from a personal point of view, and we brought Chris on as a reporter and it was a mistake for him to cross the line into a personal point of view there.' We don't quarrel with his right to have any personal point of view, although we do assert as a company that we have a tolerant point of view, we are a diverse company, and that does not represent what our company thinks. It would have been nice if Skipper had acknowledged this a couple of weeks ago (it's far stronger than ESPN's initial comment). But it's right and we'll take it. 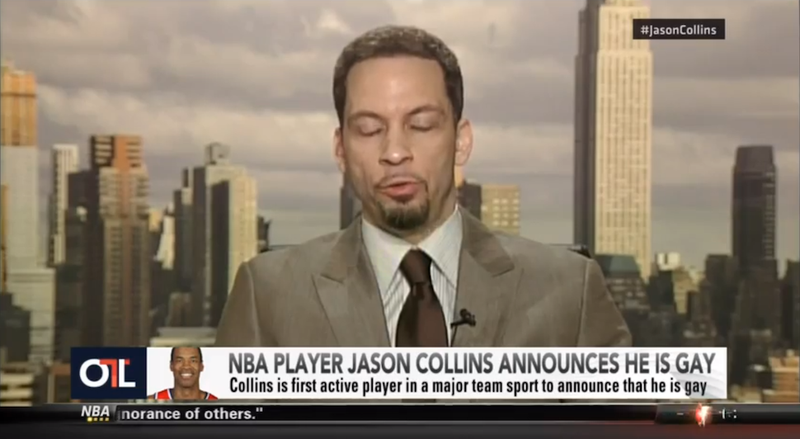 ESPN Says It Regrets Chris Broussard&apos;s Comments Were "A Distraction"